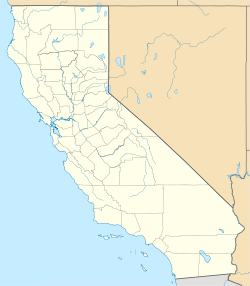 Chiriaco Summit Airport (FAA LID: L77) is a county-owned public-use airport located one nautical mile (1.85 km) northeast of the central business district of Chiriaco Summit, in Riverside County, California, United States. The airport is maintained as a functioning airport for emergency purposes and recreational VFR use by the Riverside County government. Some west coast aero clubs use the airport (and nearby restaurant) as a "destination" site for annual week-end competitions. The airport was opened in April 1943 as Shavers Summit Army Airfield and was used by the United States Army Air Forces Fourth Air Force as a training base during World War II. At the end of the war the airfield was determined to be excess by the military and turned over to the local government for civil use. Chiriaco Summit Airport as seen from the cockpit of an aircraft approaching from the West. Chiriaco Summit Airport covers an area of 570 acres (230 ha) at an elevation of 1,713 feet (522 m) above mean sea level. It has one runway designated 6/24 with an asphalt surface measuring 4,600 by 50 feet (1,402 x 15 m). For the 12-month period ending November 30, 2006, the airport had 6,000 general aviation aircraft operations, an average of 16 per day. ^ a b c FAA Airport Master Record for L77 (Form 5010 PDF). Federal Aviation Administration. Effective 3 June 2010.